With February’s crypto market activity now etched in the record books, signs are emerging that a long crypto winter may be close to an end. The total market value of all cryptocurrencies jumped 14.14 percent over the 28-day period – the first monthly gain since July, according to CoinMarketCap, largely due to signs of life in bitcoin. The leading cryptocurrency by market capitalization, BTC appreciated by 12.1 percent to end February by breaking its record six-month losing streak. But while BTC lifted the broader market, lesser-known names like Maker (MKR), Theta Token (THETA), Enjin (ENJ) and Metronome (MET) outshined with double-digit gains. Of the four, MKR was the month’s best performing large-cap cryptocurrency, defined as one with a market capitalization above $500 million. THETA was the outperformer from the mid-cap group, while ENJ and Metronome (MET) were the top entries from the small- and micro-cap groups, respectively. The data and analytics website Messari segments cryptocurrencies on the basis of their market cap as follows: large caps (>$500 million), medium caps ($100 million -$500 million), small caps (<$100 million) and micro caps (<$10 million). Maker (MKR) topped the large-cap segment with an 83.6 percent gain over the course of February and was able to reach $773 on February 24 – its highest price since early October. As it stands, MKR is the second most expensive cryptocurrency in the entire market after the world’s largest, bitcoin. MKR is one of two separate digital assets operating within the MakerDAO ecosystem along with its subsidiary stablecoin Dai (DAI). MKR tokens are created or destroyed depending upon certain price fluctuations of DAI in order to keep the stablecoin pegged to the USD. CoinDesk recently reported a substantial increase in Maker’s Collateralized Debt Positions, with the total amount of ether locked up in MakerDAO loans now having crossed above 2 million, a notable feat amid the crypto winter. The monthly price chart indeed reflects the degree of bullishness that took place. 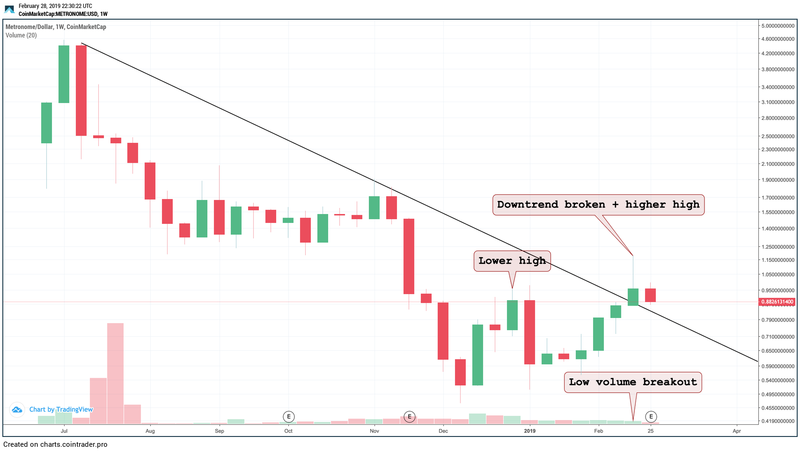 As can be seen above, the monthly candlestick has engulfed the three prior months and closed above its 14-month long falling channel – both of which suggest more bullish price action will be seen in MKR’s near future. Theta token dominated the mid-cap segment this month, boasting a 167 percent rise to close out February as one of the top performing cryptocurrencies in the entire market. The nearest mid-cap contender to Theta’s impressive showing was Ontology (ONT) which stood at 64.1 percent over the 28-day period. Theta is an open-source protocol that enables a decentralized streaming network which, in partnership with SLIVER.tv, offer esports entertainment, peer-to-peer streaming and allows for decentralized apps (dapps) to be built on top of the platform. It could be speculated that the majority of Theta’s bullish momentum is attributed to positive project developments within the Theta ecosystem. For instance, It’s likely investors have been and still are pricing in Theta’s airdrop of Theta Fuel tokens set to occur on March 12 and its upcoming mainnet launch on March 15. 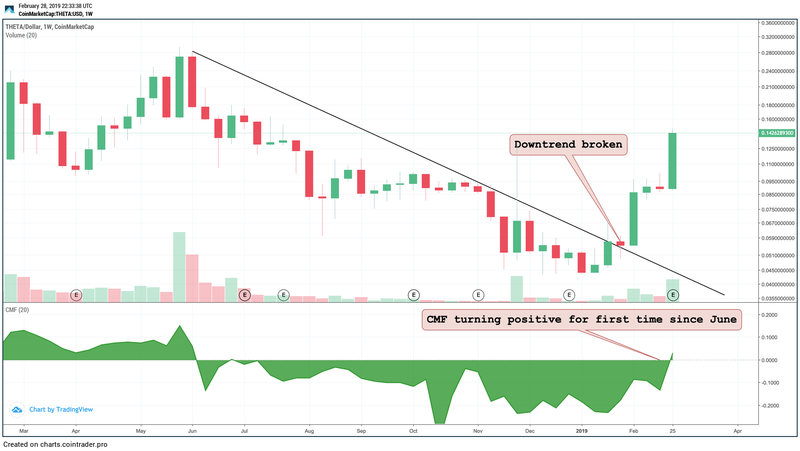 While Theta’s recent technical price developments are undoubtedly bullish, including its breaking of a 9-month downtrend and printing its first positive value on the Chaikin Money Flow (CMF) since June, investors may want to proceed with caution as the price is now overextended on the smaller time frames and is at risk of witnessing a “sell the news” reaction. Enjin Coin (ENJ), the cryptocurrency for virtual goods powered by Enjin, saw a 180 percent increase in February’s to conclude the month atop the list of the best performances by small-cap coins. Not only that, ENJ was able to record its most trading volume in a single month of 244 million, which is a total roughly four times than its entire market capitalization. The reason for ENJ’s significant price boost is easier to pinpoint than the other cryptocurrencies, largely due to the fact ENJ surged over 190 percent from Feb. 25 to Feb. 26 on the back of a rumored partnership with tech giant Samsung. While the partnership is not yet confirmed, ENJ’s price chart has indeed broken its bearish trend on the high time frames. As can be seen above, February monthly candlestick has set a higher price high above multi-month resistance levels, effectively shifting the trend from bearish to bullish favor. 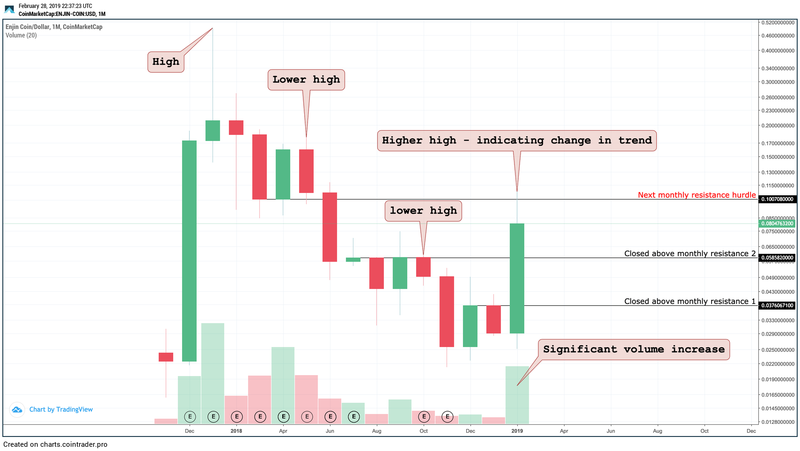 Price will now look to close on a monthly basis above the next significant resistance level of $0.10 in order to provide confirmation of more upside. Metronome (MET) outperformed all cryptocurrencies with a market cap below $10 million in February, boasting a 44.38 percent price increase. The next best performer in the micro-capp segment, Numariarire (NMR) came a close second with a 41 percent increase on the month of Feb.
MET didn’t set any notable trading volume records or witness any outlier single day performances as its price increase was gradual throughout the entire month, but was able to break its weekly bearish trend by setting a high above the previous swing high of roughly $0.97. There is reason for caution, however, since there was no increase in volume upon the change in trend. This could be seen as a false breakout without proper validation from an increase in trading volumes. Disclosure: Sam holds BTC, LTC, ETH, ZEC, AST, REQ, OMG, FUEL, ZIL, 1st and AMP while Seb holds no cryptocurrency at the time of writing.